Find and remove matching objects to rid yourself of the dreaded clutter. "Clutter is a game you can play over and over. It's lots of fun finding objects amid the clutter. The side games are great because you can go back to play your favorites anytime. And if you are a pack-rat like me, the tips on how to de-clutter just might get you motivated. Nah! It's more fun to play the game again." 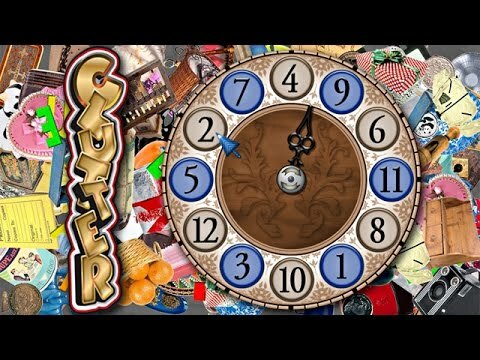 Welcome to Clutter, the original Un-Hidden Object game. The object of the game is as simple as can be. Just find and click on two matching objects to remove them from the playing field. Watch your pairs pop out and merge into one, then swoop down to the treadmill. Take on mini-games and progress through countless levels with different modes of play. Randomly created levels and puzzles give you hours upon hours of fun. Can you take on the Clutter? Clutter is a really fun game. My husband and I play it every day. It's great for your powers of observation too! The Clutter hidden object games are fun to play and improve your coordination. I am a senior citizen and this is very good for players in my age group. Love it, love it, love it. Can't get enough of the games from the Clutter series. More please. I love this game. It is so different from all the other kinds of Hidden Object games. I like it because it also includes other mini games that are different than search and find. Especially fun for the OCD in all of us! Time goes by very quickly with this game -- lots of fun and holds your interest. If you are looking for a game that is like the old Concentration game, this is it. A fun way to pass the time. Love it. Challenging and good for memory. Would recommend it to anyone. Even my granddaughter loves looking for the objects. Really like this game. It helps me with spatial capacity. You need a sharp eye to play. I enjoyed Clutter a lot. There are lots of side games, facts and suggestions. I'm planning on getting it. I love the simplicity of this game. Nice for just relaxing. It's a good game to end your day! Makes me more observant while having fun. A good Hidden Object game for all ages. I am a fan of all the Clutter games. It's engaging and entertaining at the same time, love it! Would recommend this to anyone who likes Hidden Object games.